Deo Lachman knows that someday his undergraduate work will pay off as he prepares for a career in conservation-focused research. The University of Wyoming zoology senior with an ecology concentration recently received one of the top presentation awards during the Society for Advancement of Chicanos/Hispanics and Native Americans in Science (SACNAS) national conference in Washington, D.C.
His poster presentation, titled "Nest Site Density of Leaf Cutter Ants (Atta Cephalotes) Across Land Use Types in Costa Rican Lowland Rain Forest," received one of the 2015 SACNAS Student Presentation Awards. SACNAS is a society of scientists dedicated to fostering the success of Chicano/Hispanic and Native Americans. It helps college students and professionals attain advanced degrees and support careers and leadership positions in science. Lachman’s poster presentation culminated a three-month research project in Costa Rica with Jane Zelikova, a postdoctoral research associate in the UW Department of Botany. 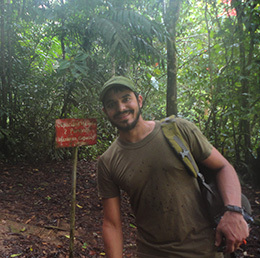 Lachman conducted research at the La Selva Biological Research Station, where he surveyed the jungle searching for leaf cutter ant nests. Lachman was an REU (Research Experience for Undergraduates) student this past summer. Zelikova says Lachman’s work was part of a larger research project to understand how leaf cutter ants influence the carbon cycle in tropical forest ecosystems. Lachman quantified the factors that influence leaf cutter ant nest density and distribution across different forest types, including intact primary forests, secondary forests, tree plantations and abandoned agricultural fields. “Leaf cutter ants are abundant in tropical forests and, though the ants are small, they make huge underground nests, so their influence is much bigger than you might expect,” Zelikova says. The ants clip fresh leaf material from surrounding trees and bring them back to their nests below ground, where they use the leaves to grow a fungus. The fungus makes "fruit" that the ants eat, which is essentially an ancient form of farming, Zelikova adds. “Because the leaves are basically fresh carbon, the ants are bringing these huge amounts of carbon into the soil, where it is transformed into either CO2 or other forms of carbon,” she says. Lachman says the project’s goal was to measure the carbon transformation and how much carbon the nests emit into the atmosphere versus how much stays in the soil or leaches out into nearby streams. To understand the larger impact of leaf cutter ants, the team first needed to know how many ant nests there are and how big they are. Originally from Illinois, Lachman moved to Wyoming from California where he was stationed as a Marine, and he received his associate degree in biology from Sheridan College. While there, Lachman was among three students who presented their research at the prestigious Council on Undergraduate Research program in Washington, D.C. They investigated the isolation components of snake venom that has the potential to prevent blood clotting. Snake venoms are rich sources of biologically active components. While life-threatening on envenomation (venom injected by a bite), the venom’s components offer potential health sciences applications. Sheridan students, including Lachman, presented “Attaching Snake-derived Anticoagulants to IV Lines” during the 2013 Posters on the Hill competition. Sheridan College is part of the Wyoming INBRE (IDeA Networks for Biomedical Research Excellence) Community College Research Network. More than 3,600 students and professionals attended the conference that showcased both undergraduate and graduate student presentations, offered scientific symposia, keynote addresses and professional development sessions. The conference also was an opportunity for students to present their research in a professional setting, with more than 800 posters and oral talks presented.